Meet Madalena. She’s a wife, mom, entrepreneur, runner, writer, and traveler. Madalena lives in Orange County, California with her husband, Andre and daughter Julia. Southern California is the perfect place for this little family of three to foster their love for the outdoor lifestyle. Both Madalena and her husband enjoy exploring new places and things - experiences they are intent on sharing with her daughter. In fact, 11-month-old Julia has already been to Washington DC (twice! ), Denver, Mississippi, and Brazil. To this family, travel + food (& coffee) is life’s greatest pleasure above and beyond any material things they purchase. To Madalena, living a life well lived and loved means staying as true to ourselves as we can be in our day-to-day lives. For her, that means minimizing distractions, doing her work well in a focused way so that she can surround herself with her family and friends as much as possible. It means consuming less so that she can experience more with those that she loves. She opened a small translation and interpreting business in 2010 and has steadily worked to pour her time, heart and soul into it. Having her own business allows her to work from home and take care of Julia while she’s still little. No two days are the same. She works with a variety of clients and translators and interpreters around the globe. Different languages and time zones keep her work challenging and exciting. She is also very passionate about supporting other small businesses and business owners. 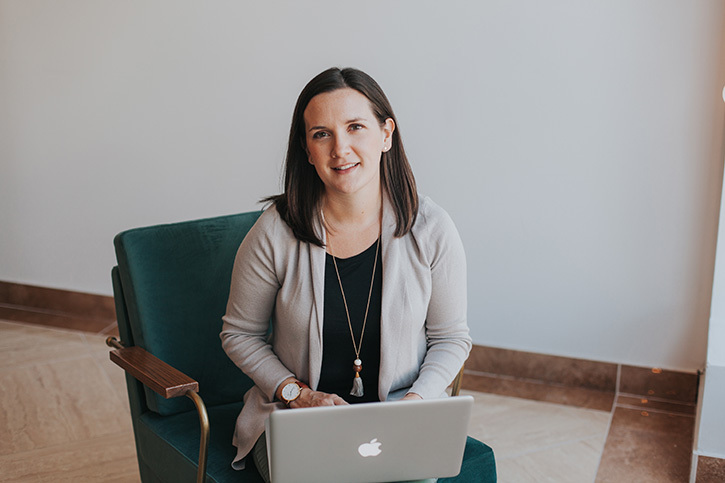 She recently started Post-Lance.com a website dedicated to supporting women growing their businesses by providing tools and training to work smarter, not harder. For Madalena, growing her business from an authentic and meaningful place is of utmost importance. Madalena’s love for analogue comes through in her passion for photography. She loves her DSLR camera and the wide-angle lenses. She adores black and white photography because she feels it allows her to tell such a beautiful and powerful story just by playing with shadows and light. 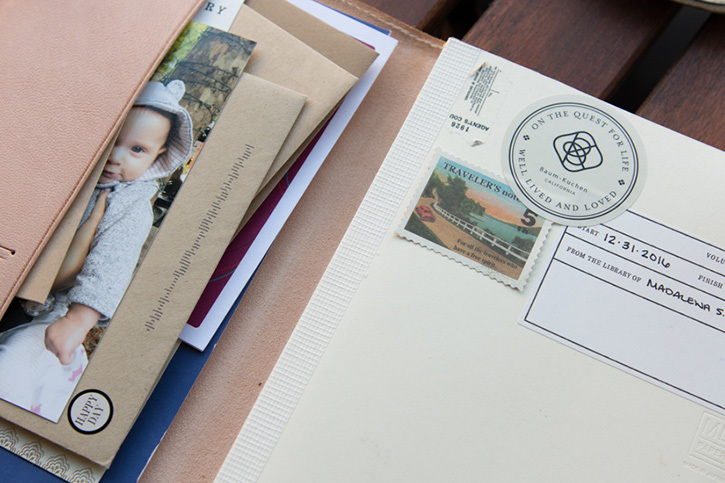 She enjoys connecting with people’s stories via letters she receives from friends that share her love for analogue. This may stem from the fact that she had shared the joy of correspondence with her Mom for as long as she can remember. Her Mom always wrote cards on her birthday and she and her mom continued to correspond via snail mail when she went off to school. They wrote to each other about everything and it never mattered what they talked about, just as long as they could talk to one another and “be” together. They shared this experience until her Mom passed away this year. Madalena keeps one of the last and most touching cards her Mom sent her in her journal as a way to always keep her close to her heart. Sharing her love for snail mail and analogue with her daughter also inspires her. Julia goes with her every day to check the mail and always comes back with a letter or package gripped tightly in her little fist. Madalena’s love for analogue runs deep. It’s not only a way for her to connect with others and share stories, it is a necessary tool to help keep her grounded. Her analogue system is her “hub” for most things business and personal. She has a system that allows her to balance both her business and personal items effectively, though it continues to evolve. Her analogue system is comprised of several analogue tools that she uses on a daily and weekly basis. Madalena finds that with so many facets of her life, it’s better for her to use the tools that fit each facet (or overlap where they can) vs. trying to combine everything into one or two notebooks. 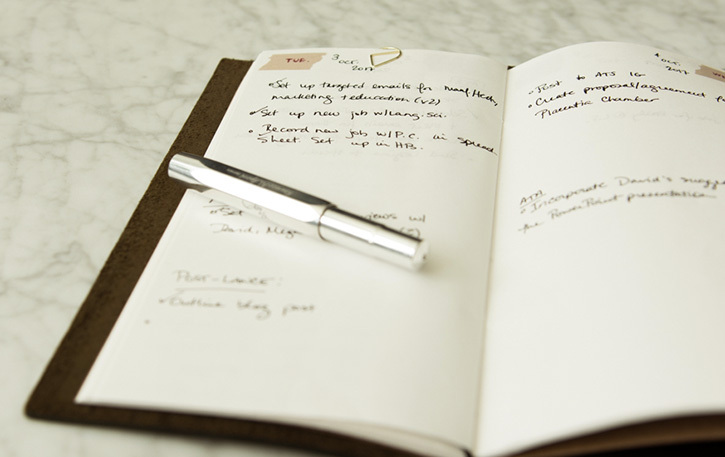 Her philosophy is to use a variety of notebooks and documenting techniques that work for her needs. 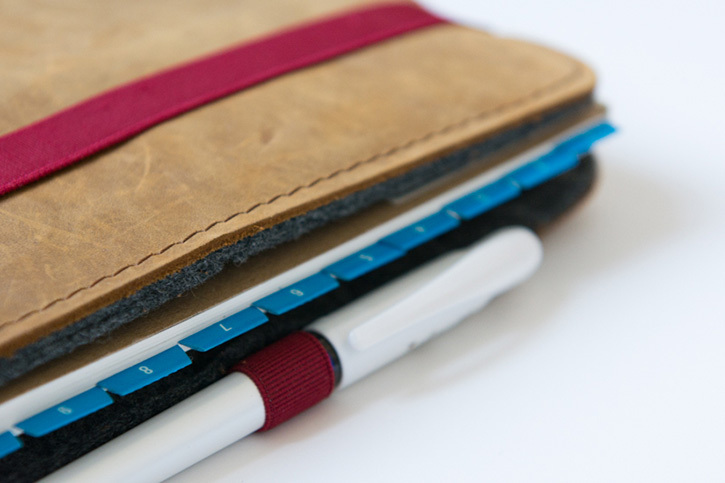 For work, she uses the Roterfaden A5 Slim in Light Brown. 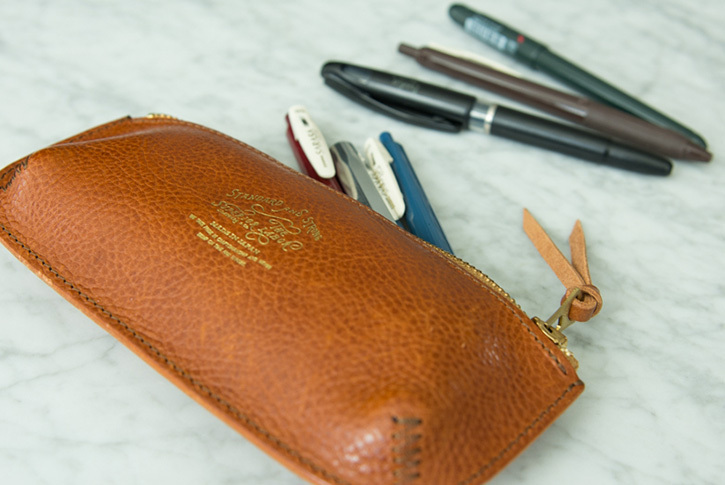 It’s usually left at her home office but goes with her to client or collaboration meetings. She’s found that a combined calendar system works best for her. In her Roterfaden Weekly Calendar, A5 vertical she incorporates her business and personal appointments, as well as her husband’s appointments and daughter’s activities. 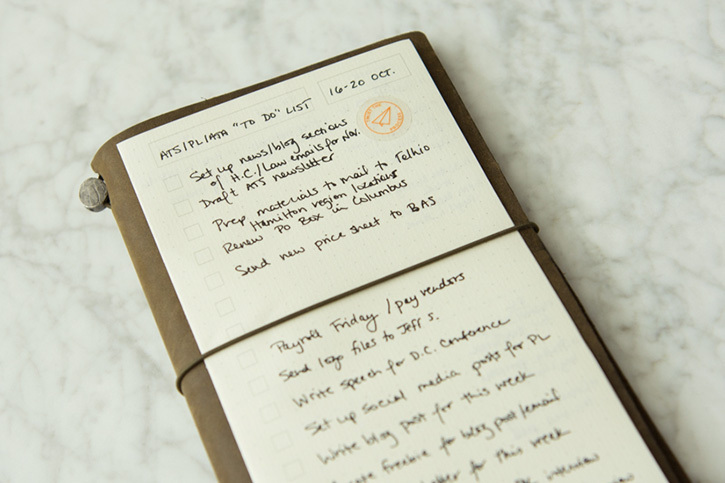 She keeps tasks that she needs to tackle in her Travelers Notebook Olive edition (the color, she says, makes her so happy!). 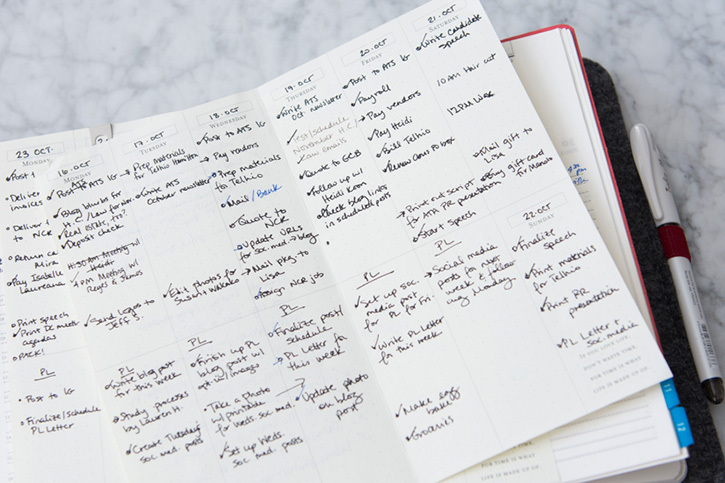 She uses blank inserts in her TN for tasks and marks each page with the date and day of the week. She’s currently testing out the BK Dashboards to see if they are a suitable replacement for her makeshift task notebook. Time will tell. Madalena also uses her analogue system for things that she wants to remember. 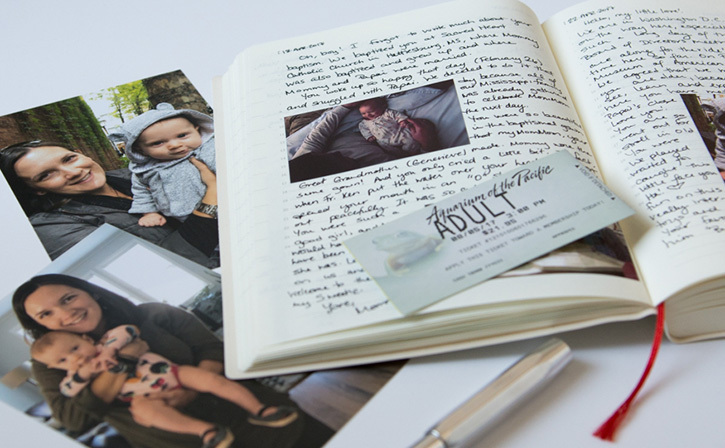 From things that she wants to purchase, to questions she needs to ask Julia’s pediatrician, her Field Notes Pitch Black Note Book keeps track of her thoughts. 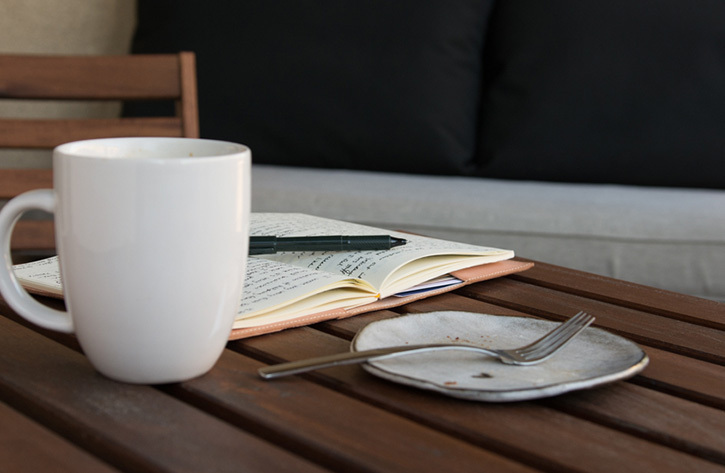 Because she feels she always has so many thoughts swirling in her head, it’s important for her to jot down the things that she doesn’t want to forget – even like things to talk about with her dear friends on coffee dates. In her MD Diary, she tries to write letters to Julia as frequently as possible. She incorporates photos, artifacts, and memories from their adventures so she will have these memories when she is older. It’s important to Madalena that Julia have these artifacts and know that she comes from a family that values travel and learning. 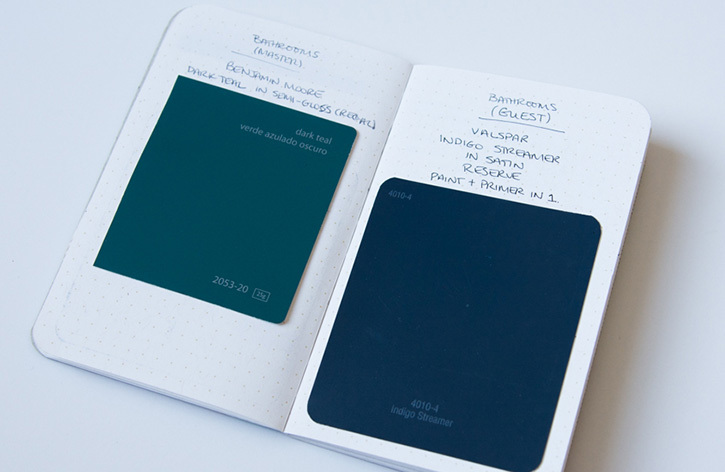 Madalena uses a small Field Notes notebook for things like household projects. She’s personalized it for what they need to keep track of in their home. It holds everything from paint color swatches they’ve used to items that need to be replaced or purchased for projects. Admittedly, she’s still figuring out her 2018 system. She's considering checking out the Jibun Techo Biz 2018 for work. If she makes changes, it will most likely to be a smaller notebook for her letters to Julia. She’s hoping to be able to easily capture their memories when they happen vs. recalling them later in her notebook. We feel incredibly lucky to call her as our friend as she inspires so many of us to stay true to who we are... not only through her pick of analogue tools but more importantly through her life choices. She is diligent and organized yet kind to people around her and those qualities really translate to how she curates her analogue lifestyle. Thank you, Madalena, for taking your time to share your story with us! If you would like, you can connect with Madalena via her personal IG feed, Post-lance, as well as Accessible Translation Solutions.